Do you know a totally wired teacher? FromWill Richardson (www.Weblogg-ed.com) today. Seems like a great way for Classroom 2.0 members to nominate each other! 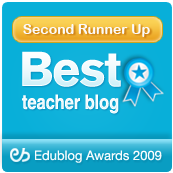 The 2007 Mashup “Totally Wired Teacher Award” will honor a trailblazing teacher who has successfully pioneered the innovative and educational use of social media (blogs, wikis, social networking, photo/video sharing) in the classroom. The award-winner likely had to overcome challenges from parents and administrators in order to use the technology, but because they understand how students use social media outside of school, they persevered with their initiative and worked collaboratively with students, ultimately sharing their insight and knowledge with the larger teaching community. If you have anyone in mind, send their names, titles, etc. and a paragraph or two as to why they are deserving to jdaly@edutopia.org. The sooner the better. Thanks! If you have luddites who aren't comfortable with the computer in your school, hold on. Computers are coming to your tables, walls, filing cabinets, doors, and oh my goodness, perhaps even that flat surface on the student desk. Devices will roll out the end of this year! The applications here for education are incredible! How about a word wall that changes depending on the class that is in your room. Think about the manipulatives potentials -- use them but NO clean up -- just a little Windex and wipe off the fingerprints! This is only the beginning. The revolution is here. This doesn't mean that technology isn't important, it means that it is more important than ever. Limiting access to computers is almost like making kids share pencils -- we wouldn't dream of it. It is not about being comfortable it is about doing the right thing. I'm sure those men who landed on the moon were not comfortable in their space suits either. This is not a place of comfort but a wonderful place where even a person in smalltown Georgia can contribute to the discussion! OK, here is your question -- HOW CAN SUCH A SURFACE PROGRAM BE USED IN SCHOOLS? Leave a comment here! Perhaps there is not as much overlap as we might think! Just go to Delicious network explorer and type in your username. This is a great answer to the conspiracy theorists as it explores the network in a fascinating way. 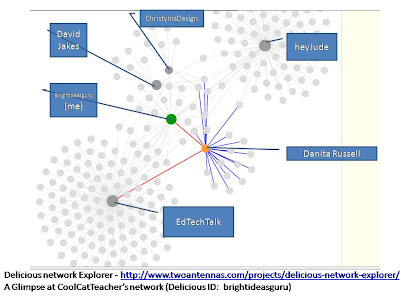 The graphic did not come out very well but it shows that David Jakes and ChristyInsDesign are very innerconnected -- Hey Jude has some connections with Christy and Danita Russell and I share a few common people with edtechtalk. This is just a cool place to explore and visualize the networks! I'm trying to find the live stream for this (if there is one) but Bill Gates and Steve Jobs are appearing live together tomorrow at the D: All Thing Digital Conference put on by the Wall Street journal. I did a little digging and if you're quick, you can share the questions YOU want to ask at http://kara.allthingsd.com/20070523/questions-for-bill-and-steves-excellent-adventure/. Join in! I am posting my question as we speak. Let's innundate them with questions from educators! 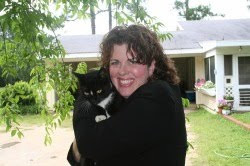 Pam Shoemaker is on edtechtalk.com tonight as we talk about training teachers. Here is the tentative agenda, and as always we will expand this and discuss! Join in the FREE and Incredible future of education conference!! George Siemens has planned another blockbuster FREE educational conference. I highly suggest sending your teachers and administrators to http://www.umanitoba.ca/learning_technologies/conferences/foe/ to sign up and to participate. Not only will they learn but they will USE the technologies like Elluminate that are going to be must-haves for the school of the future. I hope you'll join in and participate. Here is the information that George Siemens mailed out this morning -- you need to go over to his site to subscribe to receive updates. Over the duration of the next few weeks, I will provide daily emails and updates advance reading resources, and short audio files or presentations. Access information to the live portion (in elluminate) will be forwarded toward the end of the week. Please be aware as well that what you post on the Moodle Site or during the live presentation will be public. We will be using the conference itself for researching effective online conferences, as well as the nature of online dialogue and discourse. The map of participants is indeed impressive. (Click on the world map in the bottom left corner to see all of those who are participating!) WOW! The Horizon project has been fascinating, not only because of the project itself but also because of the intentional involvement of students as young as ten in the peer review process. Thank you to our 5 peer reviewer classrooms from 5 countries! Sharon Peters did a GREAT job with high school review and having it mid-project really gave the students excellent feedback and fuel to move ahead! Several peer reviewers have tackled middle school. Graham Wegner from Australia - (who does such great job over at his Teaching Generation Z blog) has been working to formulate his thoughts on the best practices of peer review of this sort of project with middle schoolers. So, after reviewing four videos on Friday afternoon, I formulated an easy format for gathering the feedback. A common format for getting kids thinking about concepts is P,M,I (plus, minus, interesting). By using that today as the starting point, one student was chosen as the feedback agent for the particular video to be viewed. We watched, and the feedback agent wrote down a point or two for each P,M or I, then recorded the class’s general feedback into their PMI sheet. If every child does that over the space of this week, then each child can type up a paragraph or so of peer review comment that can be pasted into the wiki comments for the video creators. The process seemed to work fine today but it won’t happen in a day because of the need to find time for the video viewing without carving out huge chunks from the rest of the school curriculum. But writing reviews is an important English skill, so doing so for a real and purposeful venture like the Horizon Project is an ideal situation and as I keep telling the students, a real privilege as well. What this means, even more than the students having a rich environment, that now, Sharon, Chrissy, Kim, Lisa, Graham can now "meet" to discuss the peer review process. What works and what doesn't and the most effective method to conduct such peer review. It was a bit cumbersome and we had to work out the details, but my, just looking at the PMI sheet that Graham has developed will be so very useful!! To add more excitement, Elluminate has extended the Horizon project's time in the virtual room and we can have some "meetings" over the summer to discuss and plan the methods we will use for the project we will conduct in October/ November. So, when we conclude with the awards next week, we will begin the assessment of our ourselves. The self-assessment and peer assessment from you is perhaps the most difficult for me because we are still learning and have done our very best but if we are going to improve not just as individual teachers, but improve as an educational community, we need to ask hard questions about how to make such a project replicable in other classrooms. How can we make it manageable? Besides the time zone issues, how can we remove obstacles. Can we run side by side projects with other teachers (perhaps two sets of students on two wikis -- several classes each?) What courses besides ICT / Computer Science should do such projects? So many questions. But right now, I'm just exhausted! It is hard to consider such deep questions without putting my head down on my desk! OK, back to grading! I needed a laugh today and here it is. The summary video from a 9th grader. He changed from a French accent to an asian accent in midstream. I laughed so hard. After being up till around 1:45 am last night finishing up grades, I needed it! Substrate paper? Predictions from students! Wow! From looking at the new ways to buy, read, and sell books are changing it is possible that in the future there will be no more books they will be on the computer or be shown on the wall with projectors or some kind of laser projector. They are coming out with flexible paper it is called a substrate based color electronic paper. The paper might take the place of regular paper and will also help with the global warming epidemic. These growing technological tools are going to lead to the fact that the demand for specific jobs such as programmers, webmasters, and the likes of "pro-bloggers" are going to be increased dramatically. And blogging has already started to affect the labor market that job opportunities for those who are experienced in blogging are exploding. (Indeed.com - job search engine, "blogging" search) In addition, with the rising and spreading trend of 'Digital Libraries' and internet databases the main medium of the publication business will most likely shift from paper-back books to 'internet-back' blogs or other new forms of publication. But there are issues and criticisms rising concerning this rather rampant growth of the internet-based medium of publication. The criticisms that articulate the fact that piracy is under the circumlocution of innovation. That corporations are ignoring the basic rights of intellectual property upon people for new money-making innovations. This was so well written, I admit it, I googled the text to make sure it was real. It is! Schools need to teach students how to be "social" and how to be effective collaborators because of the social world they are growing up in. Social Networks will not only change students' social outlook on things, but will help them see different ways to look at education. Using Networking sites in the corporate world gives businesses a running start to new ideas, expand their knowledge, and collaborate with others in the same working field, but that aren't even in the same country. "Eventually virtual worlds will permeate into every aspect of education. They (virtual worlds and education) will be one - inseparable, impossible to distinguish or differerientate. People will be able to attend a school solely in virtual worlds. Classes, from kindergarten to college, will be able to go inside a whale's stomach or visit ancient Rome, even design entire cities. The possibilities are endless and available. We need only to take advantage of them." I'm going to tell you that the Virtual Worlds in Education wiki is a must read. It is well researched and I can hardly believe it is written by high school students! And the vision of the future of mobile phones-- I think they are very accurate. And I enjoyed Joanna's video about Virtual Worlds. She is from Shanghai and has a great voice for this. Great overview! Goodnight! It is after 1:30 am. But I had to share these! "These Games are Why Kids Wake Up in the Morning"
"The Governments need to realize that while these games seem like just games to all the politicians, to kids and teenagers and some adults these games are why they wake up in the morning. Identity theft, kids thinking that the games are real, and sexual harassment are the three biggest threats when logging on to any one of these virtual online games. our governments need to find a way to regulate these games because the truth of the matter is that these games are the future and we need a safe future. This is the truth and if we sit back and do nothing about it our future will be dark indeed..."
While this wiki isn't perhaps one of our highest scoring ones, there are nuggets like this throughout that give us a glimpse into the passion of students and their desire to have safety in all areas where they live. Stop trying to fight it, blame it, hate it, and ignore it. We are in the midst of a fundamental cultural change. We must be models of reason -- people who don't jump to conclusions blindly but show students that we can learn new things, and make intelligent decisions about how to civilize and utilize new tools as they come along. The amazing Brian Crosby is on WOW2 tonight over at Edtechtalk.com at 9 pm EST. What a great thing to do while grading -- just catch the stream and listen (click on one of the channels.) If you wish to go into the chat, you can click the chat button on the left and ask questions and chat with us! Brian is also using wikis with fourth graders to explore animals and had a recent Visit from Krista McCauliff's mother. Brian works in a district with many low income students and is showing that yes, Web 2 works anywhere to meet very real needs. He is a very good teacher with an upbeat inspirational message. I hope you'll join us to meet this amazing educator tonight! There are so many of you amazing teachers out there, it is so great that we have a place over at edtechtalk.com to highlight the work of real teachers and just chat. This is just a quick thought to all of you teachers out there who are so busy that you cannot breathe! "Oh, I'd love to have my summers off... you teachers don't have to work in the 'real world.'" "I've worked in the 'real' world, and I love the classroom, although my hours are MUCH longer, and I make so much less, the work is very rewarding. I feel like teaching is the most noble calling on earth and nothing is more real to me than my precious, wonderful students." I truly feel that way. Teaching is a noble profession without which the civilized world would have no hope. What we do in our classroom is very important and each of us play a part in the grand scheme of society. Taking time to blog, share, discuss, and be a part of this new educational revolution is also very important. Keep on going. Keep up a good attitude. Remember that May will soon be over and you'll be getting nervous about that new class of students in the fall (as all good teachers do.) Enjoy it while it is here... a moment to sit back and say, "You know what, I did a good job this year." Keep the faith teachers, you make the world go round. Take time to encourage other teachers who may be having a tough time right now. Again, educate students about their privacy. What they don't know may come back to haunt them. Their privacy is a very valuable thing! It should be treated with care. Just a note! I have grading to do today but want to listen in on the Webheads Conference, so I went over to http://www.edtechtalk.com/listen and am listening to the current sessions. Jeff Lebow and Dave Cormier are doing an incredible service to the educational community and are going into the sessions and "snagging" the stream out. This way you can listen and grade or work. The only disadvantage is you don't see the slides nor can you chat, but that is an advantage when you need to grade! I'm listening to Professional Development using Wikis. EdTechTalk does an incredible FREE service for the educational community. I find myself over there more and more each week. All educators who are online and have a moment, should take advantage of the incredible resource put on by the "WebHeads" -- this group of people has worked very hard to bring us an incredible K-20 conference for educators. The CURRENT event can be seen at the bottom of http://www.webheadsinaction.org/. You'll see more training that you can get at a real conference and you don't even have to get dressed. It runs through tomorrow! I spent some time learning from George Siemens this morning and particularly liked this graphic. He says that often the connections we make are of more significant future value than the content or conversations themselves that are currently transpiring. Me: Well, let's eliminate paper -- if a study was done on toilet paper it would show no academic value but if we studied a history book it might have more. Me: The paper can be used for multiple purposes -- likewise laptop's value is in the use. Me: Laptops won’t make a kid smarter any more than if Einstein rubbed a kid’s head. It is about How We use laptops! It is about HOW we use laptops not the FACT that we have laptops. Too many parents brag "Oh, we have a laptop school" and guess what, those shiny new laptops have their microprocessors gathering dust as they sit in some storage bin at the end of the hall. HAVING is not the operative term here USING is. In fact, we don't have a laptop campus and perhaps get more use out of our workstations than many schools who do have laptops. Laptops can take you further but they can also be a distraction if they have no purpose. What would you do if Einstein was in your room? The simplistic thought of HAVING laptops making kids smarter, that somehow touching the keys imparts an extra 10 points to their IQ is preposterous. It is about effectively USING the laptops. After all, if we had Einstein in our classrooms, would we just want the kids to sit there and look at him and have him rub their little noggins or would we let them ASK questions (Google his brain), talk to him, take notes, video him, record him? We would have everything possible to allow the interactions. What if a researcher studied the wrong kind of paper? I could envision this report. "We have studied the efficacy of paper in schools. It is often thrown on the floor and usually flushed down the toilets. It is wrapped around trees. But it's most common use by students is that they put disgusting, smelly, slimy bodily excretions of all kind on them. This practice has to stop! We cannot allow such waste. We have studied and found that this paper causes no improvement in academic performance and therefore we show no correlation between paper and academic performance." We have to take into account the context and pedagogical use of the laptops! If we are going to do the right thing, we need to advocate doing it in the right way. Laptops in a school with no plan to use the laptops correctly is a recipe for failure, it is not progress but rather the illusion of progress. However, any tool used correctly makes a good teacher better. Add your voice for effective education using technology. I've been grading the efolio portion of the 9th grade portfolios. These are done on our wiki. Here are a couple of highlight videos that I particularly liked. Note: the video he talked about in this was never uploaded. We probably upload about 60% of our videos, some of them, while great for classroom use and discussion may not be appropriate for being available on the Internet. Atif from the ISD school in Bangladesh has done a great job with his mobile phone video. Wow! Or how about Ginger from the Shanghai School in China. I am going to enjoy watching all of the videos this summer. I am learning so much and am excited about the quality of these videos and what I am learning from them. "Off and on, over the past many months, the thought has emerged that there has to be a way of utilizing this read/write web to affect the changes we are looking for in education leadership. But I've drawn a blank. I'm not young enough. But it occurred to me this morning that we get the students to do it for us." David, thank you for your continuing leadership. You could not have known that Julie and I were in the midst of planning horizon and that your thoughts about encouraging students to envision the future would impact this. We now have more than 50 videos from students envisioning the future and it is not one that I nor perhaps even the best minds in education would envision. These projects are transforming the discussions taking place at our schools. Students are getting involved in their future! It is empowering and exciting. I think it is important to involve students in the process of envisioning the future. The most exciting thing is to see how much work and effort was put into these videos with many students finding friends to act and filming at many different locations! They give me chills! WOW! I encourage you to visit their youtube videos and comment and view them. And to embed them on your blog, click on the video to go to the youtube site and copy the embed code and paste it into your blog. Publish and voila -- you have youtube in your blog! We sat down with Terry via Google Docs recently and answered his questions about horizon. Thank you, Terry, for your kind words and for your promotion of global collaborative projects. Had a great youth summit session today in elluminate (even though I was home sick) we elluminated anyway! It was wonderful and full of the ups and downs of all learning. (This was their second time in elluminate.) I will share the link here when elluminate sends it to me! Stephen Downes on edtechtalk NOW! If you're online right now, Stephen Downes is joining us over at edtechtalk.com right now! Some exciting discussions planned with Sharon Peters moderating! I also love Andrew S's vision of the future with virtual worlds which he animated in Flash/ Movie Maker. What a fascinating project! I've learned so much from all of the students and look forward to sharing many videos with you from all classrooms. I share these first just because I watched them being made! This next is where you go if you want to understand the gaming world and virtual worlds and how they tend to become a part of your life. This student was actually the overlord of a "clan" in Halo for a period of time that was the top in the world. The video of Halo was of him playing the game and was shot by a member of his clan! Fascinating! This was the key to unlocking his interest in this project! The road into a new horizon is full of bumps as shown by today's youth summit. I thought my students did well for their first time in elluminate. After their obligatory 5 minutes of playing with the whiteboard, we settled down to business with the students improving as they went. For the upcoming schedule (in EST unless you've logged into airset), this is the calendar. 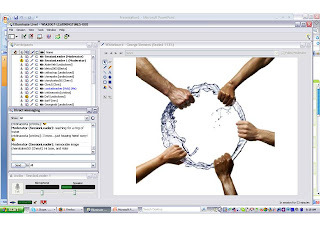 Social Networking: The must see video from horizon! The youth summit kicks off in about 30 minutes. We're excited! Just a quick preview. I've been looking at videos and will be sharing many of them with you here. Here is one from the project manager of social networking. (Yes, it stars me as "Mean Cat teacher.") All of the teams have worked very hard and I will make sure that I share with you from all of them! Yesterday at the Rotary Club I sat there with tears in my eyes listening to my sixth grader win an essay contest. Only I and a few others knew that only three years earlier he could barely compose a legible paragraph. It was third grade and my son suddenly went from a high achieving, well behaved child to one who was struggling emotionally and mentally with the tasks at hand. I knew something was wrong. Children don't just change behavior like that. I have a sister with a learning challenge (we don't call them disabilities in our family) and knew that he was coming up against something that he could not overcome. The public school said his test scores were too high for them to test so we eliminated our family vacation between his third and fourth grade year and went to the incredible icon of testing in our area, the Atlanta Speech School. We were told that it was imperative that he learn to type and use a computer for spelling and grammar as soon as possible. We had him ready and responsible and purchased him a laptop halfway through his fifth grade year. In my role at the school, we worked to raise the money and put in wireless to cover our school. Now, he is able to type all written assignments and spell check. The bright, intelligent child who shines in so many areas, can now write beautifully. I am so very proud of him because I know that I did not write the following essay, HE DID! So, today, I will share with you today the power of what happens when you accommodate and use technology to help children. And to challenge you to realize that gifted children have LD too. We all have learning differences. These learning differences must be understood and accommodated! And if you are a parent, do whatever it takes to find out how your child learns. Sacrifice, give up family vacations and never, ever give up! Honesty, perseverance, and responsibility are character traits that the community, the business world, and the whole world need more. There are many definitions for honesty. Not lying, cheating, nor stealing are examples of honesty. Being fair and upright are also part of being honest. If all the people in the world were honest, there would be no fighting, no wars, no crimes, and no lying. Give other people credit, don't take more than your fair share, and don't lie are only some of the many things honesty can teach us. Perseverance, not giving up when times are hard, is another part of having good character. Never, ever stop until the job is done. It is like when my grandma tells me the story of the frog and the butter churn. He fell in and had to keep kicking until there was enough butter to stand on so he could jump out. He almost quit and drowned, but no, he kept on kicking, and he lived. If the world had perseverance, there would be no divorce, no suicide, and no quitters. Responsibility is accepting the blame for our own actions...not blaming others for our own faults. We are all human, and we all have flaws, but we need to still take responsibility for our mistakes. When I think of these three traits, I think of my Poppa who is a farmer. Poppa is honest, and when he tells people something, they believe him because he has never lied to them before. He perseveres as a farmer when it doesn't rain or when there is too much rain. He never quits, and people around the world know he's a great farmer. Poppa has to be responsible to make sure he properly disposes of waste on the farm like the dead chickens so that the environment stays safe. I use him as my living example of good character and someone who is honest, perseveres, and is responsible. Steve Hargadon has posted the schedule for Edubloggerconn on the wiki. It is scheduled for Saturday, June 23rd from 8:30 am to 5:00 pm but you can drop in and out. Check who is attending and add your name. We'll talk more later! The Encyclopedia of Life (www.eol.org) will take approximately 10 years to create according to its founders, who will announce the effort in Washington DC today. Who are they? Some of the world's leading scientific institutions and universities in the world. They plan to catalog and share information on all of the species of animals and will allow information on SIGHTINGS from "amateurs." Projected to take 300 million pages, "The MacArthur and Sloan foundations have given a total $12.5 million to pay for the first 2 1/2 years of the massive effort, but it will be free and accessible to everyone." ""It could be a very big leap in the way we do science," said Cristian Samper, acting secretary of the Smithsonian Institution, one of seven museums, universities and labs to launch the encyclopedia. "This is a project that is so big, not even the Smithsonian could do it by itself. It is a global effort." Other institutions helping head the undertaking include Harvard University, Chicago's Field Museum, the Marine Biological Laboratory in Massachusetts, the Biodiversity Heritage Library Consortium, the Missouri Botanical Garden and the Atlas of Living Australia." Of course, as an idealist, I wish these scientists would sign up to contribute to wikipedia, the mechanism is already in place. And who is going to define "amateur?" I applaud that scientists are now seeing that the online creation of content is a valid form of scholarship. I am saddened that another behemoth is going to be created when perhaps we could take the wikipedia entries already in place and edit them. However, perhaps this is just the answer to those skeptics out there who dismiss wikipedia as a valid source of information, they won't be able to dispute this one and perhaps will be forced to unblock this resource although it will be edited by man! I just found out about it. What do you think? Disney announces that they have sold 2 million online videos through iTunes, 23.7 million shows, and 92 million ad-supported show episodes. The article at ZDNET discusses how Disney has been revamping their online activities to include more social networking capabilities and a move towards more video on demand services delivered through the Internet. We continue to move towards Internet delivery of all electronic media, but I have to ask myself how well we are moving in that direction in our classrooms. What does it take to work at Google? Last night in the WOW2 webcast with Christin Frodella, director of Google Educators network, we talked about what it takes to work at a place like Google. She stated that the "ability to ask questions" and the "ability to be self motivated without someone looking over your shoulder" and "curiosity" and "passion for your profession" as vital for working at Google. She didn't state knowledge, but of course it was implied that you were very good at what you do. I think that proficiency is assumed, students must have a certain level of proficiency. But past that, they need to be thinkers, problem solvers, and communicators in a burgeoning techno-personal world. The fact is that as our world moves online, our classrooms must move online too. Meanwhile, when I think back on the chat last night in WOW2, it seems that many IT departments are moving their school offline as fast as their fingers can type in a filter. What is being blocked now? Gmail, all chat services, Skype, youtube, twitter, were just a few of the things mentioned last night. Can we preorder videos, etc. and let some sort of iTunes like synchronization happen in the night? Or could we just invest in faster connections much like we invest in buildings. No one says, "Are we going to put a bathroom in that building?" neither should we scrimp on Internet connectivity. It is vital. Mickey Mouse's rush into online delivery makes all of the discussions about filtering and blocking and restrictions look well... very Mickey Mouse. Remember, I always advocate some form of filtering, however, there is a big difference between wise filtering and carte blanche filtering of everything. If you filter it all, why even connect to the Internet, just go back to CD's! Karl Fish's SHIFT HAPPENS presentation wins "Best Presentation in the World"
Interesting thing here -- I've congratulated the wrong person -- the creator as seen in the comments is Jbrenamen. It looks like he did a remix. I think some interesting conversations will happen about this one! Slideshare has named this presentation "World's Best Presentation!" Congratulations, Karl John?! Here is the presentation, see for yourself! Remember, the great thing about slideshare is that you can go over there and comment on any individual slide! And Karl John wins an Alienware laptop! Supercool! Great thing about Karl is that he's super nice. He recently delivered the keynote address for the horizon project. Thanks to my friend Steve Dembo for sharing this chill-bump inducing video. WOW! Sometimes we need the pictures and stories like this to share the story of what people can do to prevent bullying. Of course, we always have to be careful that by "dropping notes" as kids do that we keep balance. Often those who bully are victims themselves at home. From my new MUST READ friend Ryan Bretag, this information about a meeting tomorrow night, Sunday at 9 pm PST on EduIsland about how educators can get involved in the teen grid educational areas of second life. I may be asleep (or grading) but if I'm awake, I'll be there! EduIsland II welcomes the Eye4You Alliance Teen Island and the ELVEN Institute! ELVEN helps pre-K12 educators and librarians to integrate new technologies into teaching and learning, whilst Eye4You Alliance’s office on this island represents the creation of a direct communication channel between MG and TG adult educators. On Sunday at 9am PDT Eye4You will be holding an open public meeting on EduIsland II that will discuss how adult educators can become involved in Teen Grid education. Wikipedia Validity: Stop Reading and Start Writing Experts! Karl Fish has a great post commenting on the recent article in the Denver Post that 4 out of 5 experts agree on the accuracy of wikipedia, Karl says. "..there was no mention of whether any of the scholars contributed to the Wikipedia article they were reviewing.... It’s not like I expect the reviewers to take hours (or days) to clean up the articles, but you would think they might take an extra five or ten minutes to modify a few things since they’re there anyway. It almost seems like the thought never crosses their minds – or at least the mind of the reporter. It seems like such an obvious question to ask, and include the answer in the article. ... I find it interesting that the print version doesn’t include the URL for Wikipedia (much less for the particular topics), and that the online version doesn’t include links. I agree - here is the difference -- the expert can actually EDIT the entry (novel idea) so that the information IS accurate -- can they do that with an encyclopedia? Can they do that with a magazine article? Experts everywhere should be climbing into wikipedia and editing and not just reviewing. I think the fact that the experts were asked to read and not write was a Web 2 article written in a very Web 1 way. Perhaps if they had been asked to review and edit and see if the information remained accurate would be a better measure of wikipedia's accuracy. I had to share, this topic will really get me going! Julie and I spent 2 1/2 hours today in elluminate, learning how to use elluminate and then the last 30 minutes troubleshooting the BLASTED time zone problem that has caused problems with every online conference we've attended from K12online to the connectivism conference. And guess what, after much hacking and struggling -- the problem is solved! Now, if you don't believe me (most of you who have pulled your hair out won't) -- go to this wiki page - http://horizonproject.wikispaces.com/Student+Summit and take a look at the calendar. Press month and notice something! ***NOTE: After some testing, we found that it only converts on the page IF YOU ARE LOGGED INTO YOUR AIRSET ACCOUNT -- the following is a note from Julie on the Ning - Well, maybe not as good as we thought, but still great -- got to go invite the students to airset to make this work. Otherwise, it goes to my default as the creator - eastern time! Vicki, I am just as excited about this as you are. However, and this may be obvious to others, to see the embedded widget on the Horizon Project wiki page in your own local time you need to logged into Airset on the computer at the same time. Please someone correct me if I am wrong...it does not pick up the time from the preferences in your computer but from a link throutgh logging into your Airset account. It converts to YOUR TIME ZONE. Guess what? We entered the times in OUR TIME ZONE! (Called LOCAL TIME on the calendar) Airset converts and handles it! What does this mean for online conferences and multi-time zone projects!? This means that you can create a group in Airset and that each person can look at the calendar in their own time zone (as set up in the preferences) and that you can create events and invite other group members who get an invitation to the event via e-mail IN THEIR TIME ZONE! They can RSVP, etc. You can RSS both the calendar AND changes to the calendar. Additionally, you can use the lists feature to create lists, etc. It has blogs, hyperlinks, files, etc. And my family and I have a private airset that we use for all of these things (sorry, you cannot get to it!) I also have used RSS to pull the calendar events to my children's google start page to remind them when they log on their computer what is coming up! Because, even if you don't make your calendar public, you can hyperlink and RSS to the calendar for those who know the feed address. What can you synch with? Also, I've been using Airset for a while and can tell you that it synchs with: Outlook, my cell phone, AND my palm pilot! ALSO, I have it set to send me text messages on my cell phone telling me my calendar for the next day AND I can put reminders for events so that it will text me when I need to do something! We will use it for the youth summit? We're going to use it to allow students to sign up for times in the youth summit so we can stop HAVING TO CONVERT THE TIME AND FIGURE IT OUT! We were so excited! This has been our biggest problem. We tried Google Calendar and gave up on that after a few minutes. On a whim, we tried airset and VOILA! But, there are a few tricks, so here is how you do it! Here is what we are doing! 1) Create your personal account in airset. When you do, you will have a personal calendar. Notice that this is NOT the calendar for your group but is your private calendar. Make sure that when you do this that you click PREFERENCES at the top of the screen and PERSONAL to check your time zone. If you want to integrate your cell phone and live in North America, set up your cell phone. 2) Create a new group in Airset (see my post Rapidly Synchronize your sanity). 3) While you are still learning, you may want to just go in there and add one or two others -- you can make them organizers and they can assist you in administration. All you have to do is type in their e-mail address. 4) When you create an event, make sure on the time zone that you specify LOCAL TIME -- this means it will be converted to the local time of the viewer! This is the trick. We tried it the other way where we specified the specific time, if you do that, it will show it NOT in local time but in that time zone -- and if you mess up and create the event not in local time, it won't let you change it! You'll have to go back and delete the event and create it again! 5) To share it, you have to go Group --> RSS Feeds --> Manage -- then you can enable RSS feeds and can also fine the embed code to embed the calendar in your page. I am going to do this for WOW2 -- so convenient! I am going to create a tutorial for the students and I WILL SHARE IT WITH YOU! But right now, the house is a mess and I have a ton of papers to grade, so first I have to clean! But I'm so excited! The great thing about being on the cutting edge is that it FORCES you to innovate! It forces you to be more and do more! And when we share, others can learn! I am so very excited to be part of this educational horizon! I think that one big reason that this innovation happened is that Julie and I were able to meet F2F virtually (ha ha)-- Elluminate has agreed to sponsor the horizon synchronous communication efforts and we are so very excited! It it is GREAT! It is so EXCITING! WOW! It also means we can record and share our sessions with you and add another aspect of documentation to the process! PS -- I have been sending out invitation to Joost, a couple of you I cannot find your e-mail addresses b/c I can't view your blogger profile. If you want an invitation to the Web2 way to view TV just e-mail me at coolcatteacher at gmail.com. Such conversations on the horizon move me! It's not all about MySpace and Facebook. Explore the possibilities of the tools used in social networking for the purposes of your wiki. Tools, tools, tools! emphasize the tools! things such as bulletins, groups, blogs, friends, pictures, movies, reviews, features, profile, status, personal interests...tools are what makes social networking exciting for students to use. by tools, i mean that you don't need to say, "myspace and facebook shouldn't be used in school because they would be a distraction." you need to examine what makes students want to be involved with social networking. Note that we allow IM speak in the discussion areas although not on the final wiki product. I wish that educators could have such concise, full, meaningful discussions on these topics. Truly the students continue to teach me! And no sooner had I hit post than I can across this discussion occuring between student peer reviewers, expert reviewers, teachers, and students on a group that has been struggling - massively multiplayer educational gaming. This discussion hits at the core of this topic in a profound and amazing way. To ignore and not teach peer review and discussion strategies is to ignore the power of wikis. I am a student at Lower Canada College, recently our class was selected to peer review your projects. I really enjoyed reading your article on “massively multiplayer educational gaming.” However, although it contained some key points, and interesting facts; I found it to be lacking some content. Nevertheless, I really enjoyed the idea of creating links. Moreover, I think it would be very interesting and interactive if you included some multimedia or audio clips. In addition, I was very pleased with your grammar and structure. However, there are some areas which need improvement. For instance, I have come across a few run on sentences, and a couple words need capitalization. Nonetheless, I have to say I found the diagram to be very helpful, it added dimension to the text. After reviewing you discussion board I am pleased to say there seemed to be negotiation, yet, there seems to be a lack of discussion, furthermore, your project requires more delegation. From what I have noticed, after reviewing your history and discuss board, there seems to be a lack of collaboration throughout the project. Although am I not aware if there are specific requirements for each student, it is my understanding that one student seems to be more on task, and responsible then the other members of the group. Although your project contained dimension and diagrams, I think it would be very interesting if you would be able to create a link to an example of a multiplayer educational game. Before I finish my response, I would like to ask you a few questions, which I came across while reading your article. The first being, do you find these games are helpful, interesting and to be a good learning process? In addition, do you believe the saying “if you hear it, you will forget it?” and last but not least, what do you find is the best way learn? By listening, seeing, or getting involved? Thank you for taking the time to read my suggestions. I really enjoyed having the chance to read your article, and i found it to be very interesting. I hope you take into concideration my adivce, I beleive it will help your project a lot. Thank you for your very considered and detailed response to the student's work. keroppi, you could at least start with a discussion about the difference between MMRG and MMORPGs? I think that this is an incredible issue that needs to be expanded on the main page and hits at the heart of the understanding and misunderstandings of MMEG's. I think that a comparison and contrast could perhaps be added as a subtopic (heading 3) under the current news and actually some of the great information here should be pulled to the main page. Also MMORPG's should be mentioned on the social cultural impact analysis page as well. Get Joost, get an invite from me when you share! OK, I'm testing Joost which is a pretty hot commodity. Somehow, they considered me worthy of testing it and thus far it is pretty cool. I got a notification a bit later that I had 3 invites and gave them out on the WOW2 show a couple of weeks a go. Now, the number has been multiplied greatly and I have 100. Julie shared a great list of global projects today. There are so many great projects coming from the grassroots efforts of educators, it is time for you to join in as you plan the curriculum for next year. 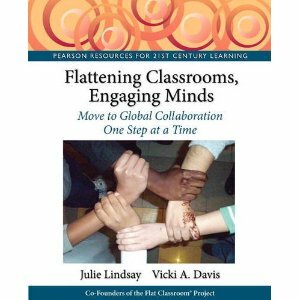 How will your students collaborate globally? Will they begin to understand their part in a global world? "Mrs. Vicki, it is like this. WE ARE SO CUT OFF IN NORTH AMERICA! With our time zones it is harder for us to work on this project than it is for the other students who tend to be awake closer to the same time. We are frustrated because of our time zone and how it disconnects us with the world!" My goodness! I guess I've been a little envious of Julie who is able to help Ed and John and Barbara more effectively because her school day overlaps theirs. Mine does not! These are the things that we don't observe or notice without such collaboration. I believe that such projects make us less ethnocentric and more globally minded and are essential for encouraging a generation of leaders who understand the dynamics of collaborating effectively. Meanwhile, my student who is working Massively Multiplayer Educational gaming and analyzing the political ramifications of it has brought to me some video from youtube. He has turned up several videos showing very blatant, terrible "gang" behavior and sexual harrassment happening on Xbox live. In this video, several gamers, (obviously men by their voices) are ganging up on a female player and continuing to kill her avatar as they cooperate to harrass and kill her. Interestingly one person is filming it. "Mrs. Vicki, this is terrible behavior and upsets me. As we move online in such environments, the companies who create these worlds are basically the government and when they allow such behavior to happen, they are allowing bad things. I think we are going to have to change the way we think about games and virtual worlds as being spaces that need rules as well. We are going to have to look to gaming providers as governments and our real governments are going to have to require behavior that is appropriate. Will there be intra -game lawsuits and complaints? Actually, some of these are self regulating however if the people in the game don't have high standards, it won't work. What would happen if each member of this game was in a different country. How would such behavior be stopped? Right now it cannot! What should be done?" And another light bulb went on. Sometimes I wonder if I am more current because my students are my teachers. Perhaps politicans and others need to be seeking the same professors as I have in my classroom. This is definitely the "bleeding" edge of technology with my students easily getting off task on youtube as others rip video for legitimate videos. I have to monitor their behavior closely and realize that sometimes although students are very excited... it may be for legitimate purposes and not for something off task! What a new mind blowing world this is! We've found that it is vital to have mid course corrections in big projects like horizon. In such a project 100% participation from all students is the objective and it takes a lot of one on one coaching to get that done! But what if one or two still hang on after this bit, this is what we are doing, and honestly, I think it is a great idea because it is VERY reflective of what I saw in the business world. Collaborative projects in the real world often require a "mid course correction" based on current circumstances on the project. This is your opportunity to make such a mid course correction. You have until sunset on Sunday (this is the horizon project, after all) to combine any two of your impact wikis. All topics must still be covered and you must link to the "old" wiki so that information (edits and discussions -- evidence of collaboration) will be preserved. This will allow you to put together effectively functioning teams so that your objective is achieved: a complete research project on your trend. Meanwhile, horizon has taken a big chunk of my blogging time as has senior slide show and efolios. However, today as I had Jimmy Buffet on my radio and the wind in my hair driving to the JV track meet for my son, I felt truly free. I sacrifice a lot to be at the school with my children and yet, though my pocketbook suffers, I am rich, and I am free. I am free to be there for my children at the most pivotal moments of life. I am supported by great administrators and free to innovate and push my classroom to the limits. I am free to blog and share with you. I am free to meet the best that education has to offer. So, for now, I am free. Enjoying the wind in my hair and the horizon in my eyes. I wish more teachers felt this free! Hey, if you're online, come on over to WOW2 where we're talking with some amazing elementary educators tonight led by Elementary Collaborator extraordinaire, Jen Wagner. It is going to be supercool and we're going to max out on the number in the skype!